At the 2012 G-8 Summit leaders committed to a ‘New Alliance for Food Security and Nutrition ‘, and as part of the follow up to the US G8 presidency in April this year the World Bank hosted the ‘G8 Conference on Open Data for Agriculture ‘, exploring opportunities to create a global platform for sharing agriculturally relevant information. Initially driven by the UK and US, this initiative is has developed into the ‘Global Open Data Initiative for Agriculture and Nutrition ‘, currently preparing for a launch at the October 2013 Open Government Partnership summit in London. As the open data concept continues to gain traction at a policy level, such sectoral open data initiatives are increasingly common, and raise a wide range of questions. This post attempts to unpack some such questions for the proposed Agriculture and Nutrition Initiative. Early open data initiatives, such as the Open Government Data initiatives of the USA, UK and Kenya, have been supplier-centric. They are essentially based on the idea that a single data holder (or, in practice, amalgamation of different departmental data holders, but all from the same overall organisation) supply the data they hold online as open datasets. An open data portal often provides a focal point for this activity. By contrast, sectoral open data initiatives draw on data from a wide range of suppliers. Some, such as the International Aid Transparency Initiative (IATI) are primarily interested in a single flow of data (in the IATI case, standardised datasets of aid funded activities), although others, such as the renewable energy focussed Reegle project look to aggregate together and integrate a range of different open data datasets with a single sectoral focus*. An Open Data Initiative for Agriculture and Nutrition may have both supplier-focussed, and sectoral focussed, elements to it. Some of the high-profile holders of data in the agriculture sector, such as theWorld Bank and Food and Agriculture Organisation already have their own open data initiatives. However, there are many more actors who might be suppliers of data when it comes to agriculture and nutrition. It is worth nothing that existing sectoral open data initiatives such as IATI and the Reegle project are relatively limited in their scope and reach, and rely on a certain degree of centralisation (the IATI Registry and Standard in the former case, and a central data store for Reegle in the latter), and so an Open Data Initiative for Agriculture and Nutrition potentially represents a new level of ambition and complexity, requiring more decentralised approaches to securing a wider range of relevant open data. 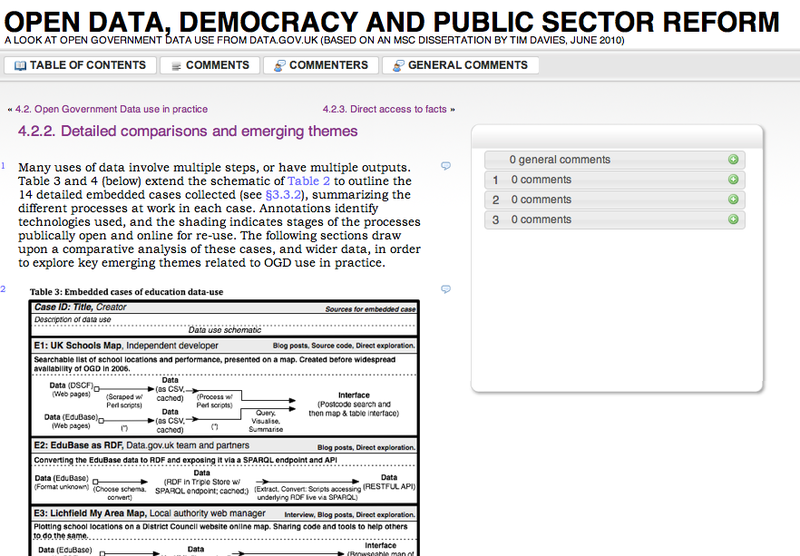 (*I’ve not looked here at sectoral ‘open data’ initiatives from the sciences as I’m less familiar with these. However, emerging collaborations around genomics research, for example, which seek to pool data into a resource for answering a range of shared research questions may also be relevant points-of-reference in thinking about the shape of an agriculture and nutrition open data initiative). Open data principles lead to lower transaction costs for finding and accessing data – and give re-users certainty that they can work with the data. For example, existing important datasets like Agrovoc do not use an open license, and can only be accessed in bulk behind a registration, meaning that users wanting to use agrovoc classifications in a dataset that also contains commercial data would be prevented from doing so without negotiations with the FAO. Applying open data principles could increase use and coherence of data. Machine-readable data supports efficient and innovative re-use of data. With access to data in standard formats, users can remix, re-interpret and re-present the data, offering alternative interpretations and generating new insights that may not have been contained in shared informational publications. Open data principles also aim to support the easy combination of multiple datasets to support the identification of new trends and patterns across different datasets. Open data allows new actors to get involved in address agriculture and nutrition challenges.Unlike data-sharing initiatives, which often work to ensure an identifiable list of actors have access to data and information, open data is, to a degree, about allowing as key unknown parties to access and innovate with data. This has the potential to bring new researchers, entrepreneurs and policy actors into the process of providing solutions to key challenges, enabling more open forms of innovation . Existing open data initiatives could do more for agriculture. With many governments already publishing open data, and agriculture and nutrition open data initiative can harness the momentum to secure new datasets that would not be provided through existing initiatives – and can work to make sure multi-purpose datasets, such as cadastral data, land ownership records, weather data and other resources are provided in ways that support agriculture and nutrition activities. I won’t assess the validity of each of these arguments here: that is a matter for empirical research – but they do highlight the kinds of areas that classic open data initiatives may focus on, and allow an assessment of how far an open data initiative may be complementary to other existing activities, or how it might connect with these. Agriculture and nutrition is a vast field, and the issues on the agenda vary wildly across the world – from securing crop production and nutritional standards in developing countries, to ensuring trustworthy supply chains in Europe, and from planning for food security, to giving consumers information to choose organic or fairly traded products. An Global Open Data Initiative on Agriculture and Nutrition emerging from the Africa-focussed New Alliance for Food Security and Nutrition could choose to look only at issues of basic food security, but this might be a missed opportunity to also consider how open data has a role to play across a wide range of agriculture and nutrition issues. For example, catalysing activity around open data on food supply chains could be driven by, and have benefits for, both food security and consumer confidence in food. An initiative also needs to consider whether it’s scope is primarily around public sector data and data held by research organisations, or whether it will also look at the vast quantities of private sector held data on agriculture and nutrition. Many governments already use targeted transparency measures to require food producers to generate and publish nutritional information on their products, suggesting that further steps to require private sector publication of open data on various agriculture and nutrition issues might not be out of the question. Self-selected commitments, or a shared agenda? The International Aid Transparency Initiative sets out a clear standard for data that all signatories to the initiative should work towards publishing. As more signatories publish this data to the common standard, network effects kick in making the data more and more useful. By contrast, the Open Government Partnership invites countries to sign up to some broad principles and then to self-select what they will do, and (if choosing to focus on open data at all) the particular datasets they might release: with the areas of focus driven by domestic engagement and pressure. Somewhere between the two, the G8 Open Data Charter includes a list of core datasets that all signatories should work to publish, and then invites self-selected commitments with a long-list of suggested datasets to focus on. A Global Open Data Initiative on Agriculture and Nutrition could identify a shared agenda based around a small number of datasets and issues, or could be driven by general principles, with members self-selecting their areas of focus. There are pros and cons to each approach, but they potentially lead to initiatives of very different characters, and consequences for the way in which different stakeholders might get involved. What needs to go into an open data initiative? I’ve written in the past about ten building blocks of an open data initiative highlighting that open data initiatives need more than datasets – also requiring explicit effort on outreach and engagement, and capacity building to enable wider use of the data that is made available. When it comes to Agriculture and Nutrition there are a wide range of actors who might need to be involved in these wider activities – from the infomediaries who translate research and data into actionable information for farmers and traders, through to the government planners or civil society activists seeking to improve the equitable and fair management of natural resources. The Ten Building Blocks of open data listed below can take many different forms, and operate at different levels of scale – but an initiative that focusses only on one or two of these building elements to the exclusion of others is unlikely to be able to realise the potential impacts of open data. There has been an interesting dialogue recently in the Open Data Innovations LinkedIn Group about “How to monitor progress of open data”. The discussion has highlighted that, as the use to which data will be put is generally left ‘open’, coming up with concrete evaluation frameworks for measure whether open data has had the desired impact can be challenging. This is of course, one of the big issues we’re grappling with in the Open Data in Developing Countries project – currently focussing on qualitiative case studies to understand how open data interacts with existing processes of governance on the ground. However, it is not inconsistent to set both a series of primary goals for the greater sharing of data against which an intervention can be measured, and to develop frameworks for monitoring secondary impacts resulting from leaving data open to re-use. Such frameworks must, however, be able to also capture unintended consequences of open data re-use – noting that not all results will inevitably be positive, particularly in contexts where so much is stake as the agricultural domain, where the interests of communities, agri-business, governemnts, environmentalists and others are not always aligned. The ODDC Conceptual Framework seeks to outline some possible directions for such a framework, as a foundation to be further revised as our 2013/14 case studies start to report later this year. The formation of larger scale sectoral open data initiatives is an emerging phenomena, and something that will need continued practical and research attention. From a research perspective, it will be fascinating to see how plans for the Global Open Data Initiative on Agriculture and Nutrition involve.